This blog will, over time, be cleaned-up and some items will be moved to my new blog which will host free downloads of my digital designs. 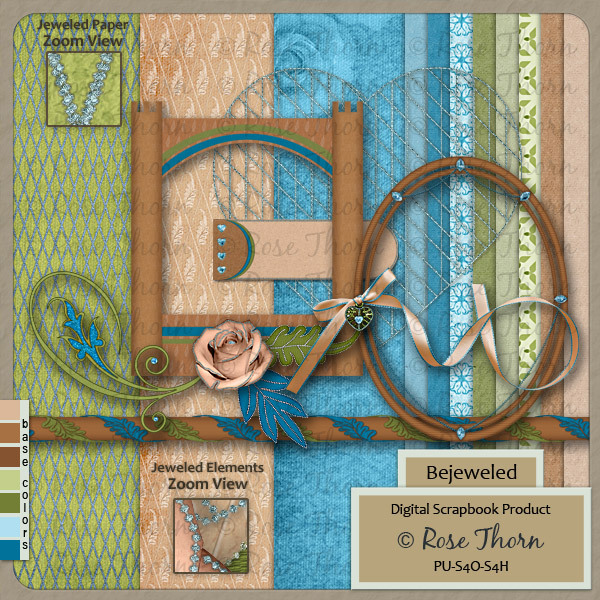 Check out my recycled 'Bejeweled' kit and my new 'Bejeweled Alpha' (free downloads) at my new blog now. Kim Broedelet (aka KimB's Designs) is one of my most favorite, digital scrapbook, designers and, for anyone who knows of her designs will know this, she has hosted many a color challenge through the years, providing color inspiration to those interested in creating scrapbook layouts or for those who wish to try their hand at designing. It's these challenges offered by Kim that first piqued my interest in designing. You can learn more about Kim Broedelet by visiting her blog HERE. Well, it's been a long time since I participated in one of KimB's Color Challenges but I had a little time on my hands this month so I created this little mini to contribute to her April 2013 color challenge over at ScrapMatters. 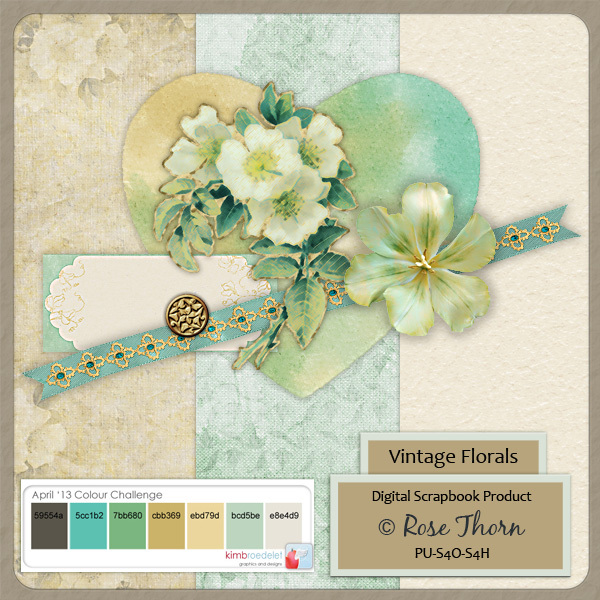 My mini for the challenge is called, Vintage Florals; I hope you like it. Although it's not obligatory to leave me a comment, I certainly wouldn't mind if you find yourself so inclined (insert smiley face here). I'm still working on the 'A, B, C's' project I mentioned in my previous post but hope to have that available here soon. Thanks for stopping by; Happy Scrapping! I've decided to close my store at E-Scape and Scrap; it will be closed sometime in the next week. The reasons for this decision are many fold, some positive, some negative - but all reasons I won't share here. 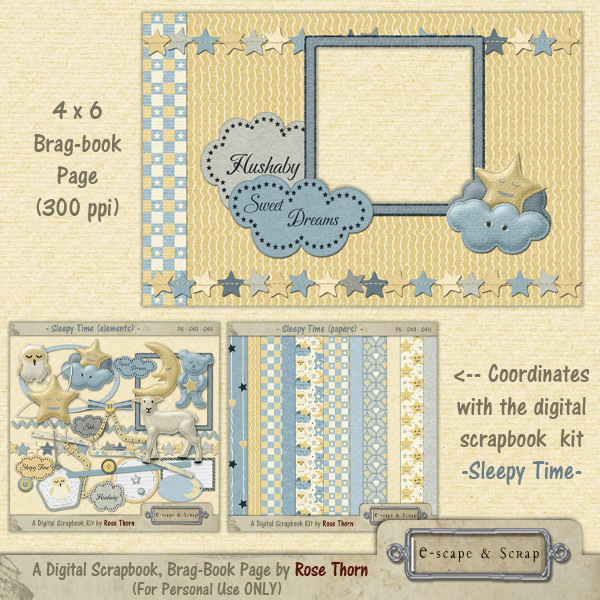 I want to take a bit of time to find a new direction for myself but, as of right now, my vision is to continue with the designing of digital scrapbook items but, instead of putting them up for sale in a store, I want to share most of them for free. I may sell an occasional item but those I'll sell from either a personal store or directly from my blog. I wish also to tap into my past work experiences developing training videos for computer software products and produce some videos or text posts for providing you with 'how-to' tutorials. And lastly, I hope to find more time to do more actual scrapbooking and post an occasional sample here; perhaps the samples will enable a bit of inspiration for creating a few pages of your own. Also, I am planning on participating in the blog train at DigiScrap Forum coming in June. So, I hope you'll not scratch me off your list of digital scrapbook blogs and come back to visit again. Thanks for stopping by today; Happy Scrapping. Time for another Blog Train! 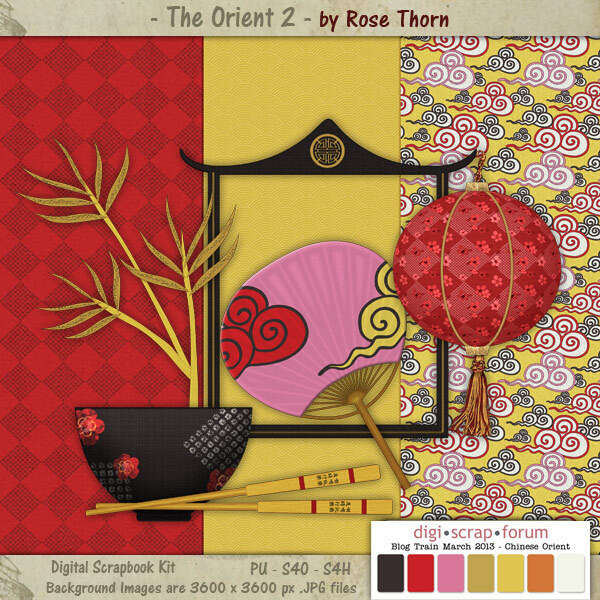 Sponsored by DigiScrap Forum - the theme is Chinese Orient. If you're following the blog train links in their given order then you would have arrived here from Designs by Gail - if you've just happened upon the blog train via my site, you can find the complete list of participating designer's with links to their blogs HERE at DigiScrap Forum. Here is my contribution to the blog train; I hope you like it. Your next stop will be at the blog of Mariscrap. 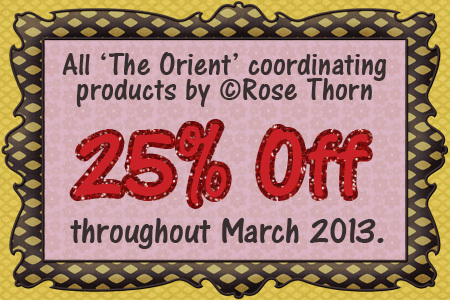 BUT, BEFORE YOU GO - Check out my new coordinating products - they'll be 25% off for the entire month of March, 2013. The Orient 1 (mini kit). 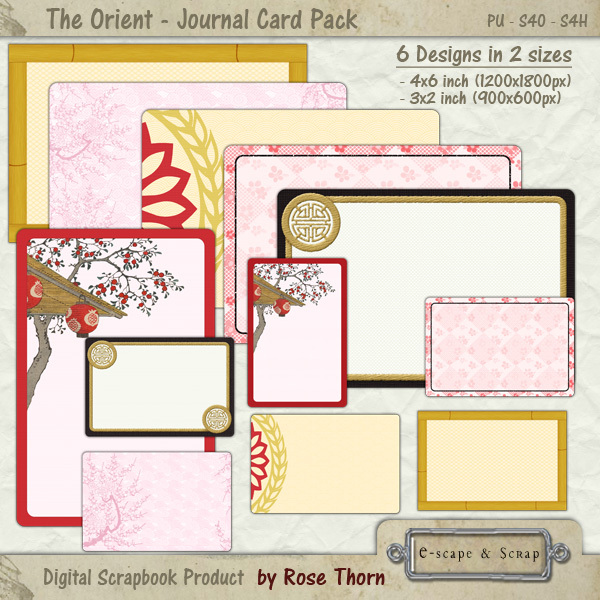 The Orient - Journal Card Pack. Great for use with pocket inserts, your 365 projects and the like. NOTE: The Journal Card sets are also available separately, if preferred. Enjoy your ride on 'The Chinese Orient' and thanks for stopping by. I've been experiencing a designer's block for awhile; I have some ideas but I can't seem to get them in motion so, for now, I thought I'd do some housekeeping in my store. I'll be looking over my older products, dusting them off a bit and get them ready for retirement (the kits, not me; well, not yet anyway). 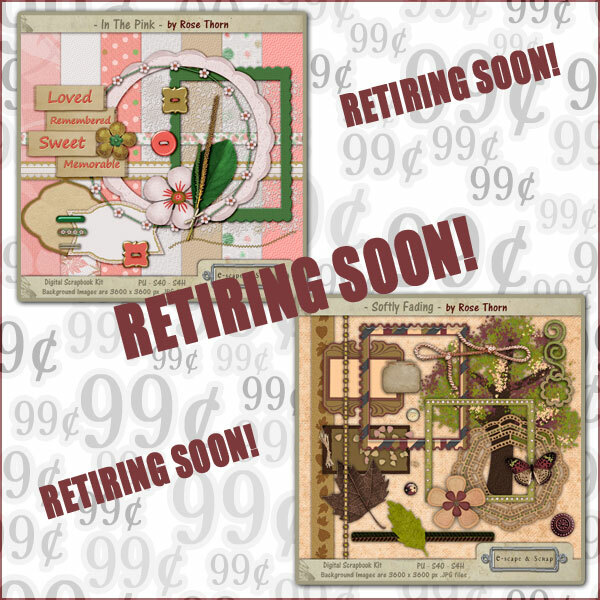 These kits will be on sale for a drastically reduced price for the week preceding their retirement! The first two kits to be put to rest will be 'In The Pink' and 'Softly Fading'. These two kits will be on sale for 99 cents ($0.99) each, beginning Saturday, February 2nd through Friday, February 8th, 2013 (US Central Time). After that they will be gone for good! Thanks for stopping by and Happy Scrapping to you! 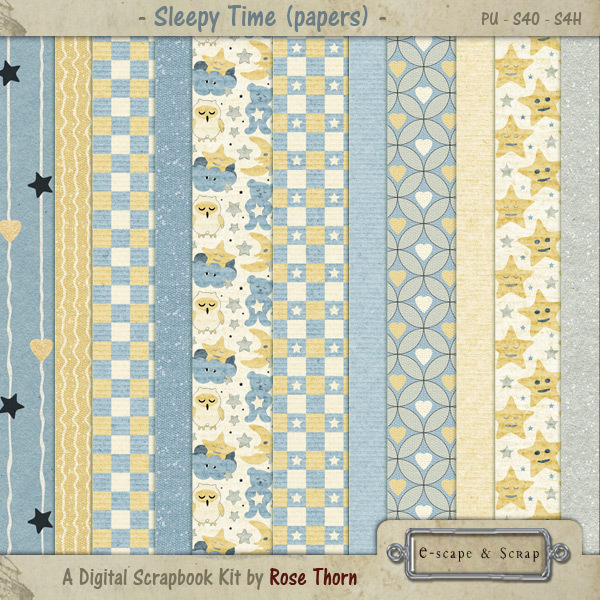 I have a new kit in my store - Sleepy Time. 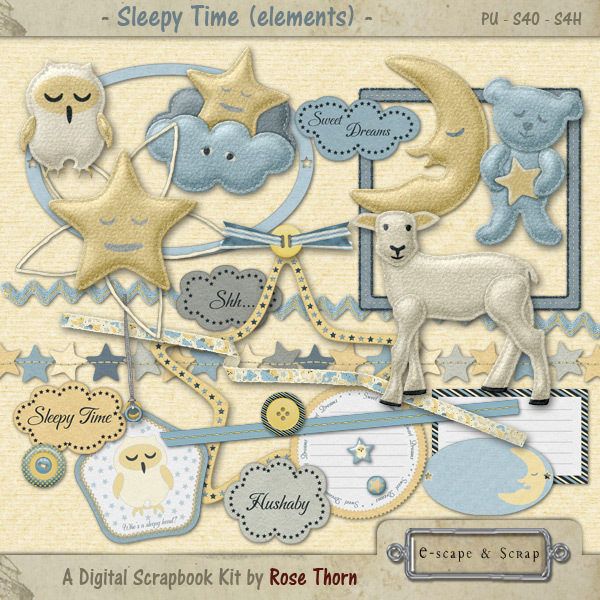 It may look familiar to you as it is an updated version of the 'Sleepy Time' kit I created late last year for one of the 2012 Design Quest challenges at Scrapping Fairytales. I've added a number of new elements and papers to the collection. You can purchase Sleepy Time from my store at The Nifty Boutique. Also available in my store is a 4x6 (landscape) Brag-book (quick) page I made using Sleepy Time. It's available for free now through Friday, January 18th (11:59 PM - CST). Thanks for stopping by - Happy Scrapping! 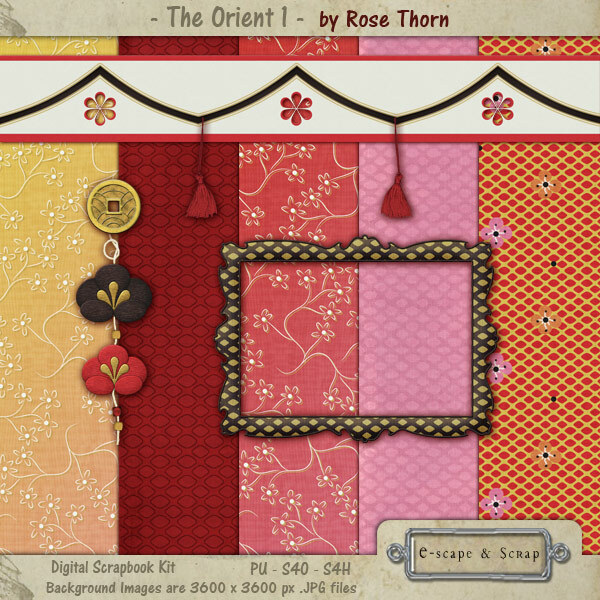 Well, if anyone was following me through the designer contest at GDS (GoDigitalScrapbooking) then you already know that I didn't win. But that's OK. I get enough enjoyment out of just participating; it helps to get me thinking more creatively. For any of you who missed my contest minis while they were available for download, they're now available for purchase in my store at E-Scape and Scrap's Nifty Boutique (but keep reading for information on how to get one free). 'Worn and Feathered' had the most changes made with a complete remake of the mat, the stitching and one of the papers and the addition of 1 paper and 5 elements. No changes were made to 'The Fab Fifties' kit. 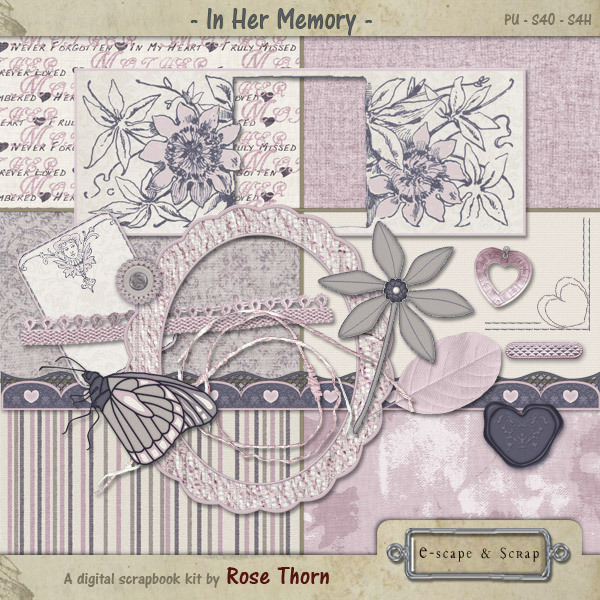 Click HERE to go to find 'In Her Memory' in my store. 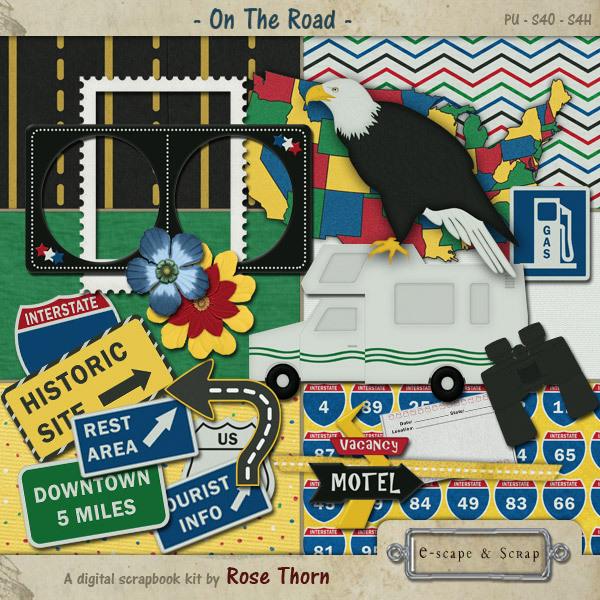 Click HERE to find 'On The Road' in my store. 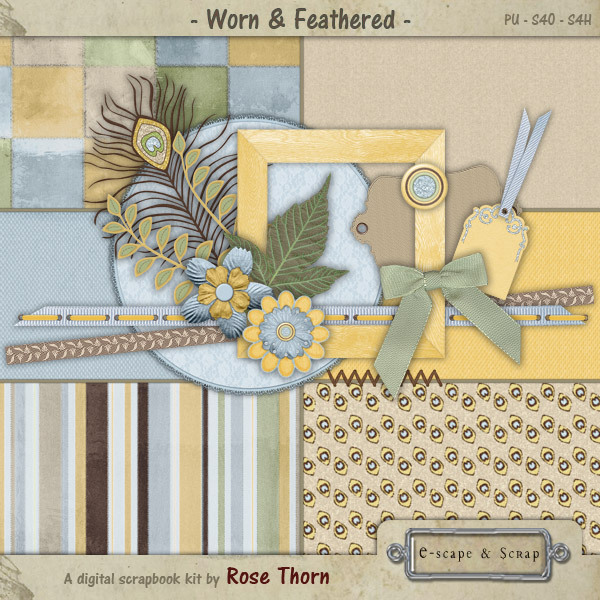 Click HERE to find 'Worn and Feathered' in my store. 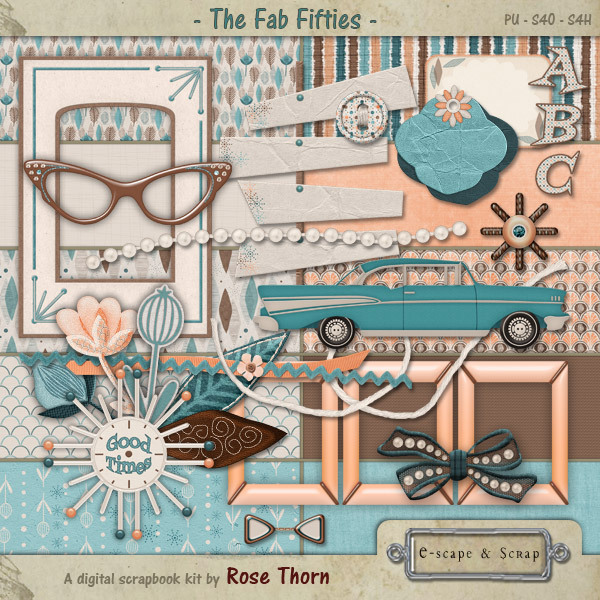 Click HERE to find 'The Fab Fifties' in my store. And, as an End of Year Gift to anyone interested, you can get one of my 4 new minis (In Her Memory; On The Road; The Fab Fifties; Worn and Feathered) FREE with this coupon. Click HERE to go to my store now. Of course, you don't have to use the coupon on my new minis, you can use it on anything in my store. Just put products by me, Rose Thorn, in your shopping cart at The Nifty Boutique with a total value of $2.99 or higher, enter the coupon code 299RT2012 and receive $2.99 off your total purchase (once per customer). 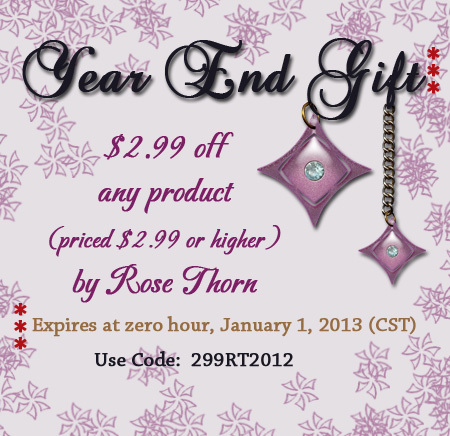 The coupon is good through the end of the year; it will expire at, zero hour, CST, January 1, 2013. Thanks for stopping by... here's wishing everyone a very Happy New Year!